There are many topics that could be brought to the worlds attention about foster care, but there is one topic that needs more attention "Aging Out". Aging Out is a hot topic in the foster care world and our youth have expressed interest in wanting more knowledge as there journey continues. 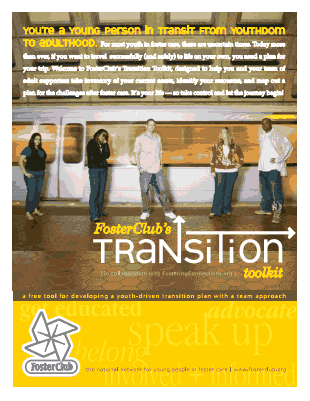 FosterClub has a wonderful transitions tool kit for our youth that are aging out of foster care and we encourage them to download this tool kit and map out there journey of life. To view or download the transition tool kit CLICK HERE.